The kids are back in school, the mornings start of brisk and the streets of Ukiah are heavily lined in abundance of color that is quite enchanting. It is fall and everyone is dressed in layers because even though the mornings start off chilly the high for the day may be in the low eighties. Our downtown has several warm and inviting places for you to sit and enjoy your morning tea or coffee. Many locals know the baristas and wait staff by name and the friendly employees most likely know a little something about them as well. If you want to enjoy a freshly baked pastry made on site that morning or a warm meal they have you covered. As one continues on, the exotic colors of the season will continue to amaze and perhaps you’ll become interested in a variety of tree that has not caught your eye before. The boutiques will be filled with clothing, gifts and more that you may not find anywhere else and you are sure to find something for everyone. Just like the array of colors existing in nature the businesses carry a variety of different styles, items and services. Each year fall color shows up in spectacular splashes and Ukiah residents are reminded of another wonderful characteristic of this region. Visitors alike are sure to enjoy the explosion of the fall tree foliage that is even difficult to capture in photos. 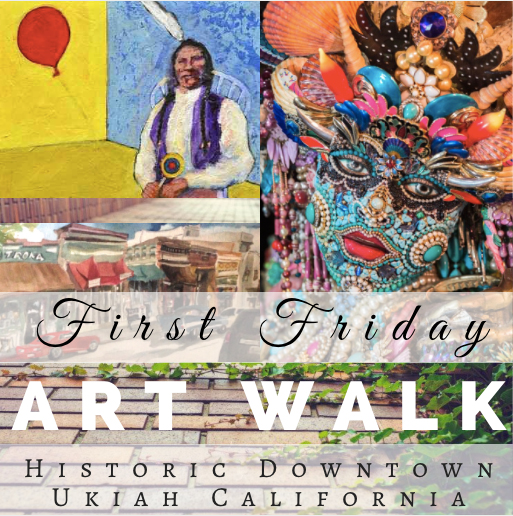 Ukiah First Friday Art Stroll with over 7 local art galleries join us the first Friday each month in Historic Downtown Ukiah from 5:30-8pm. Local art galleries will display their fine arts and crafts for all to enjoy. Most of the galleries also offer some light appetizers, refreshments and wine. Call Art Center Ukiah for more information 462-1400.